So the delicate negotiations begin. Though at home I get plenty of time alone, I'm not 'allowed' out unaccompanied. There are a few reasons. Unlike a lot of Stroke Survivors, at least, the ones I know, I look quite unaffected. The disability can be quite invisible. Part of the reason for that is I quickly got to dislike the 'disabled' label, and I worked very hard to appear normal in the early years. Going out was always going to be a problem. Though my intellectual facilities had not diminished, as I quickly discovered, I became, and still can, be very confused in crowds and around busy traffic. I'm told I have a habit of 'wandering off', and I find walking any distance exhausting even with support. Since my cerebellum (latin for 'little brain', at the bottom back of the brain) was mostly destroyed, which amongst other things controls balance, walking is very much like walking the deck of a ship, or a tight rope. You can do it, but heck does it take practice! I can fall over unexpectedly. We call them "hello floor!" moments which can leave me looking like someone beat me up. I also have a few communication difficulties. I have to slow down my thinking so that my mouth can keep up, and I do have times when I know what I want to say, but it just won't come out or comes out wrong, and I can seem distant or worse, drunk. This is known in the UK as Aphasia and Dysphasia, and in the USA as just Aphasia. As a kid I had a pronounced stutter. I never thought I'd say this, but if it wasn't for the speech therapy I had back then I'd be stuffed now. To further complicate matters, over the years I've had mini strokes, which have had a cumulative effect, and recently, fits. As you can imagine, all this had a tremendous impact on my independence. I went from a marathon runner who loved hiking, orienteering and very early morning breakfasts at Café's I loved to track down, to someone who never goes out alone. Morning paper? Forget it. A pub? What's that? I've never had a McDonalds (suspect I'm not missing much) A coffee with friends, holidays, visits to my old haunts in the Uk or on the continent. Nah. And I lost my driving licence. I'm watched by a nervous family when I eat, hovered around the bathroom door when I (in my modified) shower. I've had worried neighbours phone the police if I wander a few yards to a local wildflower field to forage or sit on a bench. "Dray, get in the car mate. Ah-ah-don't argue. Get in the car" Sheesh. I'm not allowed out alone. Somewhere along the line I was actually classed, I recently discovered, as "a danger to myself and others" Makes me sound like a bonkers mad axeman. New doctor at our surgery. Young chap. Knows his stuff. Naturally, I had my Bear with me. Raised his eyebrows when he saw that my stroke prevention tablets amounted to 23 a day. "Blimey!" he said. Then he put me through a battery of tests. "Right" he said. You've not been to Neurology for yonks, but you're going. May be a wait. As we left he said "Dray, ring me". So I did. He explained that though everyone's concerns are legitimate, I have to regain a degree of independence, I must be allowed to make mistakes, and that people will just have to worry. "We" he explained "are just going have to work out an action plan. Oh, and next time you come down, leave the missus in the waiting room". I think I like this man. The delicate negotiations? Well, I run the family finances. Very good I am too. We are in credit with absolutely everything, which I believe is a little unusual. No debts. But if I'm going to get out alone, I need to reserve a little for personal use. The family have become used to, ahum, appropriating anything left over for their use. That local Café I want to try not too far away? Really going to have to update that profile pic. Lost a lot of weight since then, as after Christmas finishes I always go back to Ye Olde Goatee. Day 22 of my Very Odd diet. I started out at 90.3 kg, and I'm now at 86.1 kg and dropping. It's a bit of a mystery why I put weight on in the first place, as I only eat a small meal a day as I don't get hungry. I lost the hungry gene years ago with my first stroke. So I don't nibble either. The current theory at the docs is it's a side effect of the interactions between the 23 tablets a day I take. Apparently the interactions between so many tablet of various combinations is impossible to calculate. Why a Very Odd diet? Because I made no change to either my food, exercise or tablets. I just decided to lose weight and I did. Very odd. But it works. Perhaps I should write a book entitled "The State of Mind Diet". Getting the fidgets again, despite having three projects on the go. Probably means, after a lengthy break I'll probably find an excuse to do some complex bookbinding again. Binding a book is usually straightforward, as is rebinding a book. Anyone can do it - you can find basic guides on the internet, for instance, have a look on Pintrest here or search Youtube. I'm not a big fan of rebinding old books, though I've done it. If you have a very, very old book then pay the price and approach a National Trust restorer who will not only advise you on the cost, for a fee, explain preservation, archiving and storage, for a fee, and in exceptional circumstances restore it. For a fee. They may even register it and the advice followed so they can keep track of it. Don't assume if you do, the book is valuable. Value is subjective. It may be commercially worthless, but if it's worth it to you to pay the hundreds of pounds for a family treasure to be maintained optimally, it's worth a fortune to you, and it's worth doing it properly. Me? I've been presented with three hundred year old beautifully annotated family bibles and journals, a wealth of history in need of tender loving care. I've placed them carefully in a large folder bound with twine, asked the owner to pay for a safe deposit box, keep a handwritten journal, on proper embossed paper, and every six months I'll that bind it for them. Then they can store that along with book. Complex bookbinding is an entirely different matter. It's the creation of a work of art irrespective of the contents usually - hey, I'm no reviewer. But if I can do the obvious and create art that reflects the contents, excellent. Complexes is that I do purely for the love of it. It's a long, and if I was to charge, expensive and arduous process. The length of time it takes is, well, as long as it takes, and that can take weeks if not months. I don't have photos of my work here, for privacy reasons that would take too long to explain, but if you look at the Pintrest page above, you'll see a Dragonfly cover which I admire. Copyright the artist. Going to have to change that profile pic. I'm a bit slimmer and have a goatee nowadays. Just as I'm cooling down after someone confidently said to me that there was a direct correlation between Stroke and lowering IQ, and that it is quantifiable in IQ points, and by implication a loss of intelligence - then annoyingly said "we'd have to agree to differ" when I had the temerity to disagree. Some chuff said something similar today. Read it somewhere, they said. Can't remember where. Hmm. Stroke is complex, and whether it affects cognitive or reasoning function depends on where in the brain the stroke occurs, so sure it can affect function. Stroke can certainly affect the ability to process or express language, which can be further exacerbated by loss or reduction of motor control. But these are not indicators of intelligence, or the lack of it. I hold my hands up here and say hey, IQ tests are fine as a clinical tool to determine support, but beyond that are no demonstration of ability or personality, and are more important to those who like to self aggrandise. Otherwise, if you can do the job, and the boss is happy with your work and the time it takes to do it, then smile. If you can't, find another job. To me, thedemonstration of ability to function in your environment, whatever that environment is, is rather more important than some test, unless that test is designed to provide support or training to enable one to fulfill a function. IQ can be fun though. I love it when people draw comparisons with people like Einstein. Bit of a problem there. In his time, there were no IQ tests, though a quick google shows that it was estimated (how, I dunno) at somewhere around the 160 mark. The mean IQ of the UK is 120. Which, if you know anything about statistics, is meaningless. As for me? Well now. Twenty odd years ago I was unhappy in my job and hunting. A job required an IQ test, and the prospective employer, with a cheeky grin, asked me whether I wanted to do a "How to do an IQ test" course. I went in with an IQ of 140. Came out with an IQ of 220. You read that right. Two-Hundred-And-Twenty. They made me do that IQ test three bloomin' times in three weeks. 220. In the end? I got fed up. Didn't pursue the job. The employer? The NHS. My present IQ, according to Mensa, is now 153, which puts me in the 'top' 3% of the UK population. Not bad for a Strokie. Go figure. I'll finish with a couple of quotes. Prof. Stephen Hawking. Has done an IQ test, says it's prob "around 160" but, "People who boast about their IQ are losers"
Albert Einstein. IQ unknown. "I seem to know how to guess correctly"
A visitor commented "....but you look so normal..." and then looked dreadfully embarrassed. S'right. I'm used to it. I noted it, because that's the way I'm made. People watcher. There's a bit of me that always stands back and watches. A few self deprecating jokes put them at ease. It would seem that either due to personal experience or well intentioned (and important) television adverts, people have expectations of what a Stroke Survivor should look and, well, be like. But a stroke is a brain injury, the brain is a complex organ and everyones brain is different. It really is that simple. 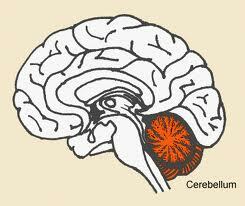 The brain is the control centre, and how it affects the bits its attached to varies enormously. I have physical probs, but I also have cognitive problems. I can also remember how my 'mind' worked before Stroke. Cognition and mind are interlinked, but aren't necessarily synonymous. I may not understand immediately. It's a bit like theres a filter between me and the outside world. But as I'm inclined to stop and think before I speak anyway (I used to have a bad stutter as a kid) it isn't really a problem. Ish. A bit distressed at the moment. A diabetic friend had been in hospital with breakages and edema due diabetes. They wired him up and after a few weeks they allowed him home. So he hobbled up here, went for a pizza on his way home, and the chuffin metal work fell apart not long after he was home. 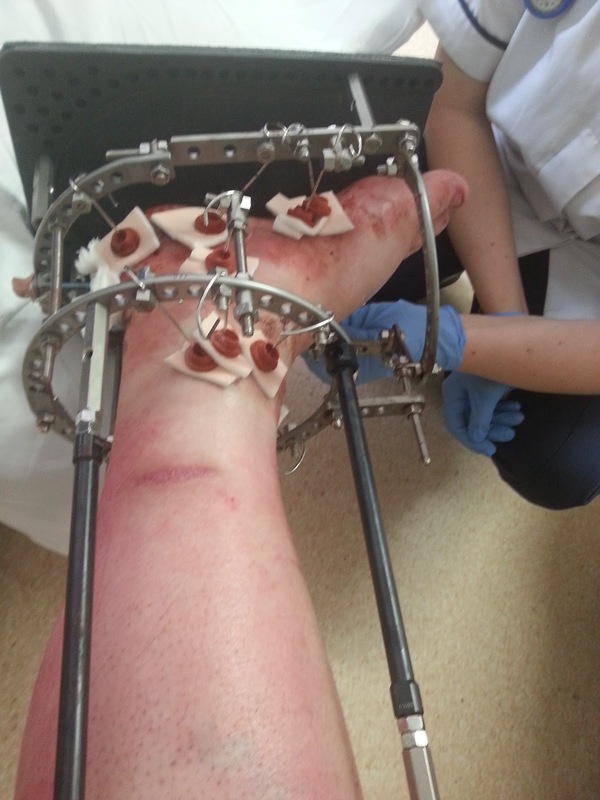 Titanium and stainless steel rods through his leg. Now he's back in again. This is what he was released from hospital with......... I shake my head in wonder.